Satellite imagery shows a broad low pressure area centered near 10.8° N / 39.5° W or about 1400 miles east southeast of the Windward Islands. Conditions appear favorable for slow strengthening and for this feature to become a tropical depression. It is moving west at about 15 mph. Early forecasts gradually move this system west northwest and recurve it northeast of the Lesser Antilles by the middle of next week. These are early forecasts. If you are traveling to the eastern / northern Caribbean next week keep updated on the progress of this system. There are two other strong waves behind this one near the coast of Africa and still over Africa. Re: Next tropical wave well east southeast of the Windwards. Satellite imagery shows a broad low pressure area centered near 10.8° N / 42.0° W or about 1200 miles east southeast of the Windward Islands. Conditions appear favorable for slow strengthening and for this feature to become a tropical depression. It is moving west at about 15 mph. Early forecasts gradually move this system west northwest and recurve it northeast of the Lesser Antilles by the middle of next week. Another model has it just north of the northern Antilles by Thursday / Friday. Neither model develops this wave very much for now. Visible satellite imagery shows that deep convection is increasing west of the circulation. 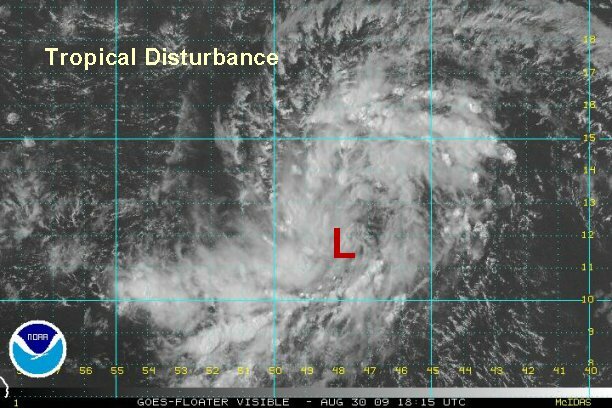 It appears that a surface low is organizing and we believe that this feature is now a tropical depression. We expect The National Hurricane Center to classify this system as a tropical depression today - probably on the 11 am edt / ast advisory. Satellite imagery shows a broad low pressure area centered near 11.5° N / 45.0° W or about 1050 miles east southeast of the Windward Islands. Conditions continue to be favorable for slow strengthening. Top sustained winds are estimated at 30 mph and slowly increasing. It is moving west at about 15 mph. Tropical forecast models are split on this system. Most recurve it northeast of the Leewards, some take it close to the northern Antillies later this week. These are still early forecasts. If you are traveling to the eastern / northern Caribbean next week keep updated on the progress of this system. No change in the headline. Organization continues and we believe that this is a tropical depression. Winds will start to slowly increase as convection builds near the center of circulation. Satellite imagery shows a broad low pressure area centered near 11.8° N / 47.5° W or about 860 miles east southeast of the Windward Islands. Conditions continue to be favorable for slow strengthening. Top sustained winds are estimated at 30 mph and slowly increasing. It is moving west at about 15 mph. Seas are building 9-13' near the low. Tropical forecast models are split on this system. Most recurve it northeast of the Leewards, some take it close to the northern Antilles later this week. None of the models develop this system very much. If you are traveling to the eastern / northern Caribbean next week keep updated on the progress of this system. Tropical Depression: A tropical cyclone in which the maximum sustained surface wind speed (using the U.S. 1-minute average) is 33 kt (38 mph or 62 km/hr) or less. Tropical Cyclone: A warm-core non-frontal synoptic-scale cyclone, originating over tropical or subtropical waters, with organized deep convection and a closed surface wind circulation about a well-defined center. Once formed, a tropical cyclone is maintained by the extraction of heat energy from the ocean at high temperature and heat export at the low temperatures of the upper troposphere. In this they differ from extratropical cyclones, which derive their energy from horizontal temperature contrasts in the atmosphere (baroclinic effects). As you can see, it doesn't take much to get a tropical depression. Quickscat now shows a closed circulation. Wind estimates are only 10 mph on the southwest side, but near 35 mph on the north side. Convection is now popping up around the whole circulation. We believe that the definition of a tropical depression was met earlier today. Satellite imagery shows low pressure area centered near 12.0° N / 47.8° W or about 860 miles east of the Windward Islands. Conditions continue to be favorable for slow strengthening. Top sustained winds are estimated at 35 mph and slowly increasing. It is moving northwest at about 10-15 mph. This may be a temporary motion and a more wnw may resume. Seas are still near 9-13' near the low. Forecast models are a little closer together this morning. They take this feature a little north of the Leewards. A more west northwest motion is then indicated toward the Bahamas. The models weaken the tropical system at this point. Some try to redevelop it off of the Southeast U.S. coast in about a week. The models are having a hard time forecasting this feature. When a tropical system is weak it is not a good idea to trust them. We need to wait ( possibly by later today or this evening) when their is better development. Recent forecast models generally take this system north northwest then generally west over the next few days. This would place this feature near or a little north of the Leewards Wednesday night and Puerto Rico Thursday morning. It is curious to note that the models tend to lose this feature as it heads toward the Bahamas. This would support the tropical system entering into a more hostile environment. We will watch this cautiously. If you are traveling to the eastern Caribbean / northern Caribbean / Bahamas / Turks and Caicos this week keep updated on the progress of this system. 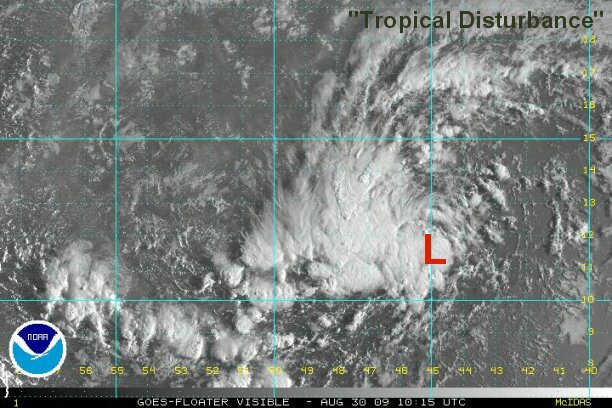 It appears that our feature east of the Leewards remains as an unofficial tropical depression. Quickscat satellite still shows a closed circulation at the surface. Winds are light southwest of the center, but remain about 35 mph near the convection. It appears that the center is under the deep convection. 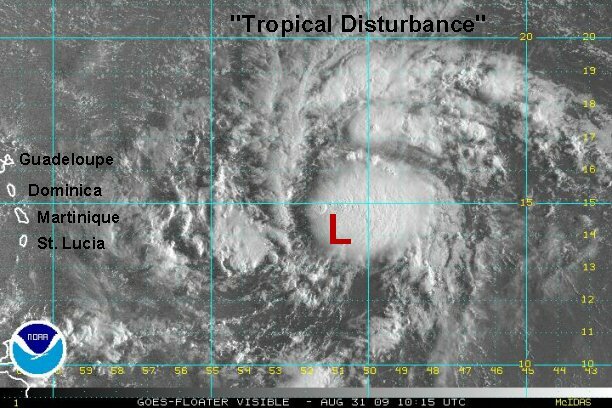 The unofficial tropical depression is centered near 16.5° N / 53.0° W or about 530 miles east of Guadeloupe. Conditions continue to be favorable for slow strengthening. Top sustained winds are estimated at 35-40. The tropical system is moving north northwest at about 10-15 mph. Seas are still near 9-13' near the low. Some of the outer rain bands are near Martinique. Forecast models take this system generally west over the next few days. This would place this feature near or a little north of the Leewards Wednesday night and Puerto Rico Thursday morning. Models still tend to lose this feature as it heads toward the Bahamas. This would support the tropical system entering into a more hostile environment. We will watch this cautiously. The surface low appears to be running ahead of the deep convection to the east. The thunderstorm cluster looks the same as last even with maybe a slight increase. 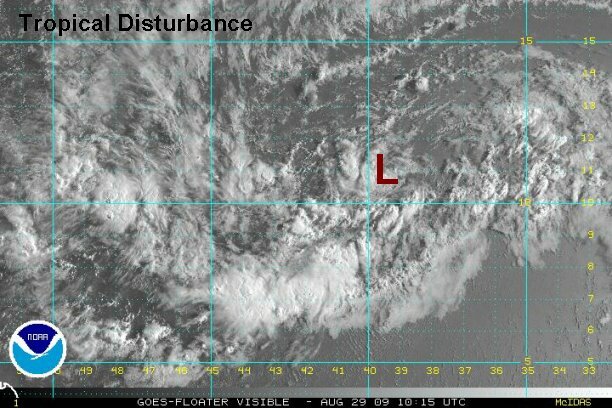 Some westerly upper shear is affecting this tropical disturbance. 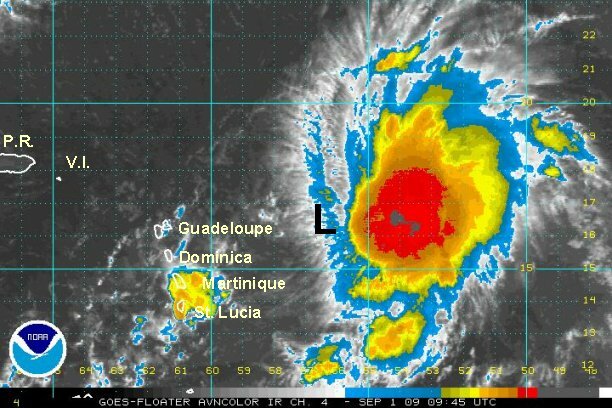 The unofficial tropical depression is centered near 16.4° N / 56.3° W or about 320 miles east of Guadeloupe. Top sustained winds are estimated at 35-40 mph. The tropical system is moving just north of due west at about 10-15 mph. Seas are still near 9-12' near the deep convection. A small cluster ahead of the tropical disturbance is spreading showers over the Windwards and southern Leewards at this time. Forecast models take this system generally west northwest over the next few days. This would place this feature near or a little north of the Leewards Wednesday night and Puerto Rico Thursday morning. Models have shifted a little north with the lastest runs. One scenario keeps the low near or north of the Islands and fades it out near the Bahamas in several days. The other keeps it just north of the Islands and recurves it well east of the Bahamas. We will watch this cautiously. The surface low appears continues to ahead of the deep convection to the east. 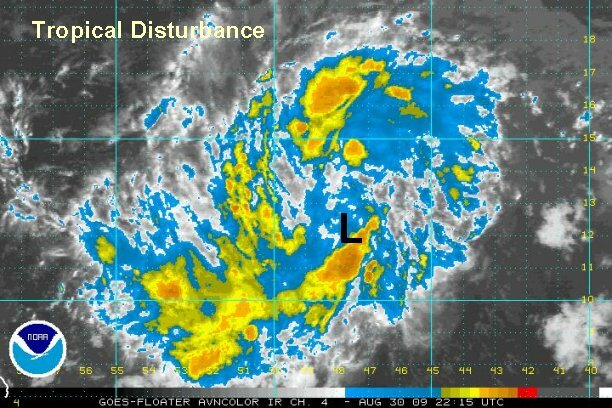 Some westerly upper shear is affecting this tropical disturbance by keeping the worst weather to the east of the low. 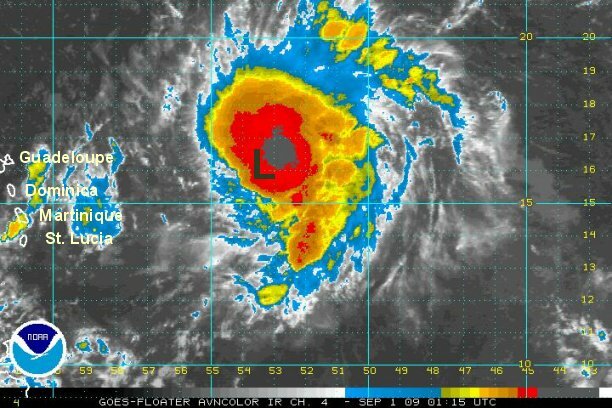 The unofficial tropical depression is centered near 17.2° N / 57.3° W or about 300 miles east of Antigua. Top sustained winds are estimated at 35-40 mph. The tropical system is moving just north of due west at about 10-15 mph. Seas are still near 9-11' near the deep convection. Scattered storms are building over the Lesser Antilles ahead of the tropical disturbance. 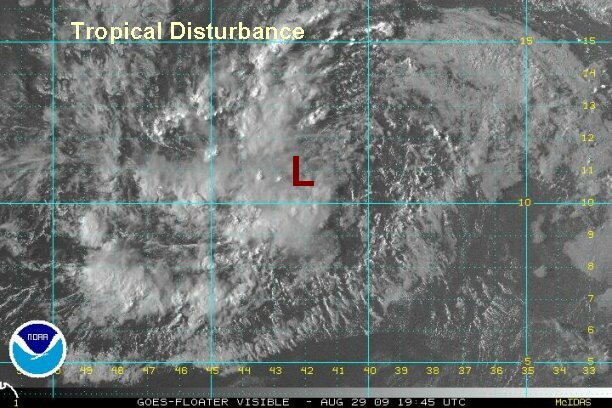 Per the recon....NHC has now joined. Top sustained winds 50 mph under the deep convection. 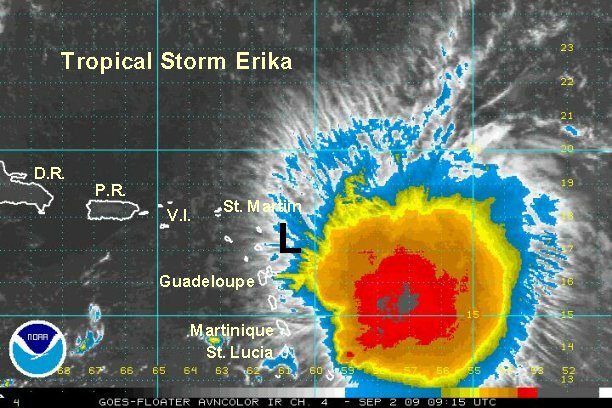 Tropical Storm Erika. Cloud tops are rapidly cooling indicating a development phase. The southwesterly wind shear appears to be weakening allowing for development of thundershowers near the center of circulation. Erika is centered near 17.2° N / 57.3° W or about 300 miles east of Antigua. Top sustained winds are estimated at 55 mph. Tropical storm Erika has slowed over the past few hours. Seas are now up to 16' near the deep convection. At this time tropical forecast models develop Erika over the next couple of days, then weaken it before reaching the Turks and Caicos as upper air shear increases. Additional development may reoccur as is moves away from the Bahamas early next week. If you are traveling to the eastern Caribbean / northern Caribbean / Bahamas / Turks and Caicos into this weekend keep updated on the progress of this system. At first glance Erika looks fairly impressive. In reality their has been little change since last night. A beep burst of convection is still going on east of Martinique and Dominica. Also, the low level center is more stretched out this morning. NHC is going with one farther east. Visible satellite and radar show a distinct center near Antigua and Guadeloupe. NHC mentioned the difficultly in the placement this morning. We'll all have a better idea in a few hours with more visible satellite images. 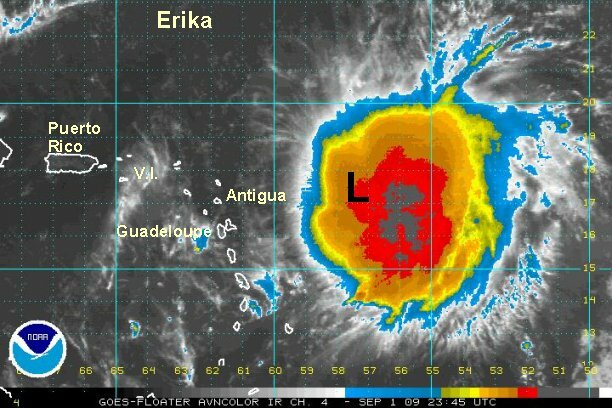 Erika is centered near 17.0° N / 61.0° W or about 50 miles east of Antigua. Top sustained winds are estimated at 55 mph. Tropical storm Erika is moving west slowly at about 5 mph. Seas are at 16' near the deep convection. At this time tropical forecast models develop Erika over the next couple of days, then weaken it before reaching the Turks and Caicos as upper air shear increases. The models split again Saturday and is noted with a range in the forecasts below. If Erika stays fairly weak as it is now, this would favor a more westerly track over the northern Antilles into the Bahamas as a weak system. Tropical forecast models still stay with the scenario of increased shear near the Turks and Caicos / Bahamas to weaken the system with most models. As the recon alluded to, Erika has multiple centers. This is unusual and indicative of a poorly organized system. 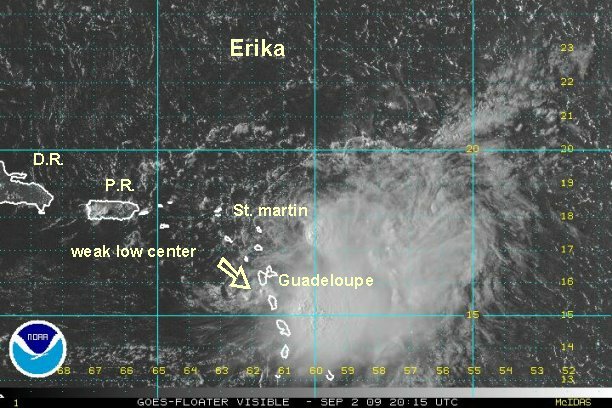 The first center is clearly shown on radar over Guadeloupe. The other is near the deep convection and is just becoming apparent on visible satellite imagery. The forecast models tracks diverge in a few days most likely due to the lack of clear organization in the low levels. 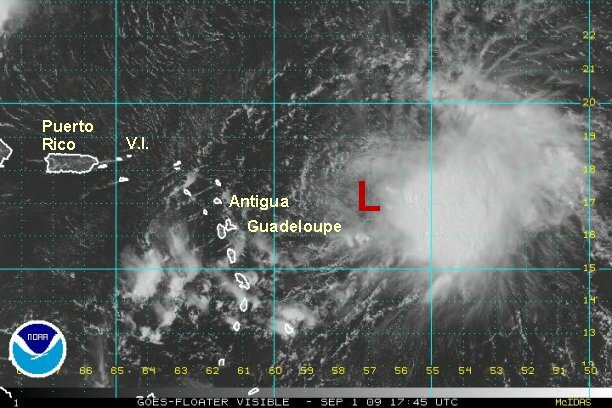 One low level center is over Guadeloupe. 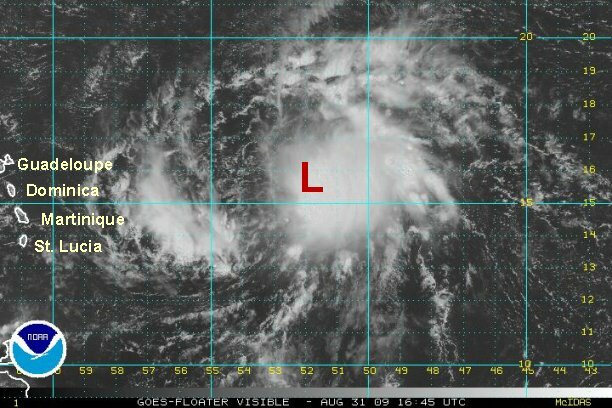 Another low is centered near 17.2° N / 58.0° W or about 250 miles east of Antigua. Top sustained winds are estimated at 45 mph. Tropical storm Erika is moving west slowly at about 7 mph. Seas are at 16' near the deep convection. Just like Danny that preceded Erika, this tropical storm is poorly defined at the surface. In fact it has degenerated into several low centers which is unusual to see. Rarely do center of circulation reform and we are again looking at system which has done just that. This means that Erika remains a weak system. 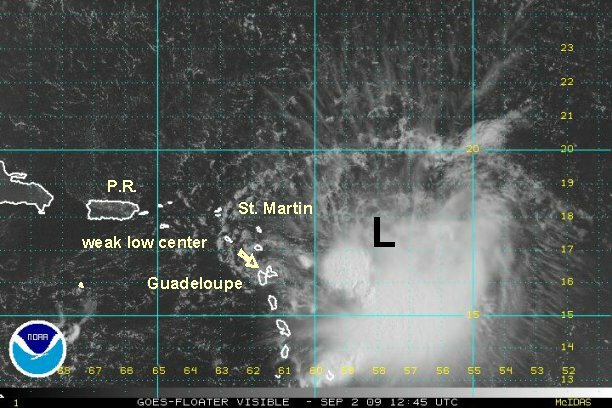 The main low is centered near 16.4° N / 61.7° W just southwest of Guadeloupe. It looks like NHC is going with our low center of earlier this morning. Top sustained winds are estimated at 40 mph. Tropical storm Erika is moving west slowly at about 10 mph. Seas are at 17' near the deep convection. It looks like forecast models have had a better handle on the situation that previously though. Wind shear has set in a little early disrupting the development of Erika. This is good news for travelers or those living in the path of the storm. Erika is degenerating into a hard to define system at the surface and may only be a depression within 24-36 hours. Keep in mind locally heavy rain still may occur. If you are traveling to the northern Caribbean / Bahamas / Turks and Caicos into this weekend keep updated on the progress of this system.